If you happen to be one of the healthy eating conscious that uses the Android platform, and like to track your progress towards reaching your goal, there is now an Android application called Fitbit that enables the user to log food and activities wherever you are. The Fitbit app for Android delivers the ability to log food, workouts, weight, and water whilst on the move, along with locating foods from the app’s database and also create custom entries, and access your favourite meals and food. With the Fitbit app there is a Food Plan feature that can deliver a calorie intake plan whether the user is trying to maintain, or achieve their weight goal that allows you to pick a plan intensity which suits your personal lifestyle. Whilst unlike other calorie apps, your calorie allowance adjusts based on your activity level. 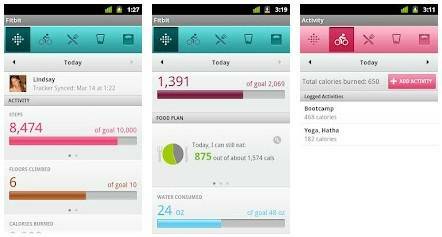 With Fitbit for Android, the app’s dashboard allows the user to check their stats for today and up to two-weeks previously, whilst enabling you to see your latest steps, floors data and calories burned when your Fitbit Wireless Tracker syncs with a base station, although you must of course have a Fitbit account and a network connection to use the app. For those that would like to take advantage of what the Fitbit app for Android has to offer you can download the application to your chosen Android device running Android 2.1 or above for free from Google Play.